American Micro Products Inc (AMPI) is a wise choice for your glass-to-metal needs. 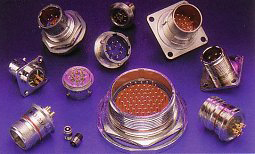 American Micro Products, Inc. is a world class manufacturer of circular, glass-to-metal, hermetically sealed connectors. Our Qualified Products List (QPL) consists of MIL-C-26500 Bayonet and threaded, MIL-C-83723 Series III, MIL-C-38999 Series I, II and III. We build commercial equivalents to MIL-C-26482 Series I and II as well as the MIL-C-5015 Series. We also supply your custom design terminal seals, transducers, scoop-proof connectors, custom high-voltage applications, and harsh environment connectors. Whether your glass-to-metal requirement is standard or a special design, American Micro Products, Inc. is your wise choice. Our facility contains state-of-the-art equipment, quality systems, and engineering. Our dedicated people will meet or exceed your expectations in a timely manner. Whether your applications call for mild steel, corrosion-resistant seals, special alloys or titanium, we offer contacts in a variety of alloys including Alumel, Chromel, Kovar and 52 alloy, as well as plating finishes to meet your design requirements. Download our free catalog featuring the AMPI standard Hermetically Sealed Connectors product line.